It was my friend's birthday last May 3 and we (Hanzel, Steve, Oyo Boy, Me and the birthday girl Atty. Princess)celebrated it by having lots of fun in Metrowalk, Ortigas. We started the whole night of fun by having dinner in Oyster Boy. We ordered Beef Kaldereta, Baked Oysters, Kangkong, and Adobong Pusit. The latter being Hanzel's favorite. I liked the oysters very much... I actually had four big oysters. I think I ate most of it. After being full to almost the brink, we looked for a good place to have a few drinks while playing billiards. 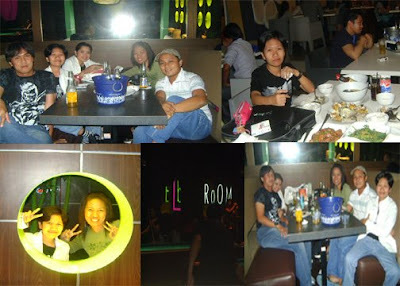 We found the "Elbow Room" on the second floor of the Metrowalk. It is a nice place, with a singer to serenade those who are not busy playing. We actually had two buckets of beer and played billiards for two hours. I don't really know how to play billiards but I enjoyed trying to hit the ball and make it go to the nearest hole possible. We stayed there until 1AM, just playing, drinking, talking and having fun. 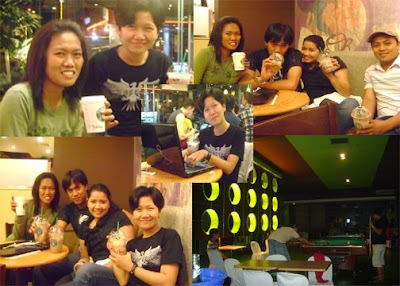 To end the night out, we had coffee in the nearest "Starbucks" that we found on the ground floor of the Metrowalk. I had a cup of hot coffee while they all enjoyed their frapuccino. We were still a little bit drunk, tired and sleepy when we decided to go home. I actually slept while on the way home, that's the good thing about not having to drive. Fun has ended and by 3:30 AM, I was safely brought home by my friends.